Given the dangers in Iraq, where do journalists go and not go? The riskiest part of the country, journalists say, is Sadr City, the sprawling Shiite neighborhood that is home to about a third of Baghdad’s population. Some 80% of the journalists characterize it as extremely or somewhat dangerous. Those dangers add to the newsworthiness, as Shiite militias there have become de facto governments. Despite the risks, and because of the newsworthiness, about one-in-three (32%) of the journalists have visited Sadr City within the last year. The press corps ranks three other areas as only marginally less dangerous: Anbar Province, the vast area west of Baghdad where the United States says it has recently made significant progress in quelling violence; Fallujah, a city within Anbar where the U.S. military has conducted two major offenses; and Basra, in the country’s south. More than 75% of the journalists describe all three areas as extremely or somewhat dangerous. In evaluating eight other locations listed, most journalists (71%) consider Erbil, the largest city in the Kurdish-controlled north, as mostly safe – but no other. 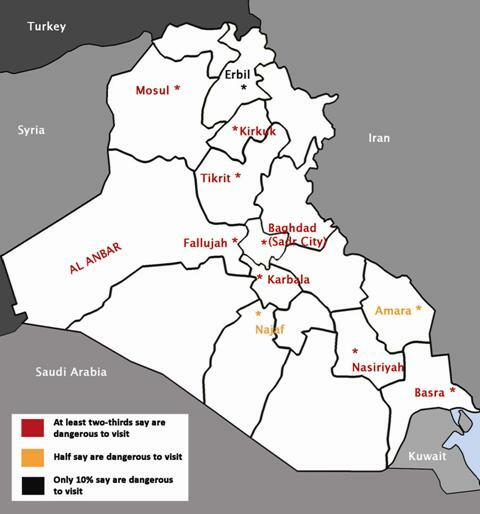 Journalists indeed regard all of the seven other cities listed in the survey – Amara, Karbala, Kirkuk, Mosul, Najaf, Nasiriyah and Tikrit – as dangerous. Journalists talk, too, of threats extending to where they work and sleep. “Having to make sure your desk seat is not visible from outside …, that you’re not in risk of getting showered with shattered glass while you write, scanning every car on the street for low rides (too much weight) and weapons, is not journalism,” a bureau chief wrote. “It’s amazingly scary." Survey Q: Based on what you know about the country as of today, how safe are each of these places for a reporter to go to (excluding when they are embedded)? Given the dangers, journalists conduct their reporting under remarkable security constraints. It is nearly as much the norm for reporters and producers to travel with armed guards and get-away vehicles as it is to carry notebooks, tape recorders and cameras. Nearly eight in ten of the journalists surveyed (77%) work for news organizations that have hired a professional security firm or security guards. The same number (77%) say that their organization has emergency plans in place in case their bureaus come under fire. When the journalists go out for reporting, they are usually accompanied by armed guards (73%), go with a chase car (76%) and travel in an armored vehicle (68%). A small number (8%) have additional security. Only 8% of those surveyed says they work without any security at all. Security issues also extend inside the Green Zone, the heavily protected area within Baghdad where senior American officials, the Iraqi president and the Iraqi parliament have offices. Most journalists (84%) say security restrictions within the Green Zone hinder their reporting somewhat or a great deal.